The Web Marketing Association is pleased to announce the call for entries for its 20th annual international WebAward competition. The WebAwards are the standards-defining competition that sets industry benchmarks based on the seven criteria of a successful Web site. It recognizes the individual and team achievements of Web professionals all over the world who create and maintain outstanding Web sites. 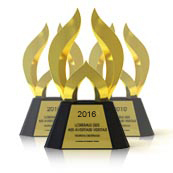 The deadline for entry for the 2016 WebAwards is May 31, 2016. A complete list of past winners and this year’s entry form can be found at www.webaward.org. A “Best of Industry” WebAward will be given in each of the 96 industry categories, including marketing, travel, BtoB, hotel and lodging, biotech, education and politics. The competition’s highest honor, the 2016 WebAward “Best of Show,” will be given to the one site that the judges believe represents the pinnacle of outstanding achievement in Web development. Last year’s Best of Show winner was Trailer Park, Inc. for their exceptional work on JurassicWorld.com. The site was also recognized as Best Movie Website. The Web Marketing Association will also recognize the interactive agency winning the most awards in the competition with the “Top Interactive Agency” WebAward. For the third time, the Top Agency award was awarded to Extractable taking home a record 31 WebAwards. They also were recognized at the Top Agency in 2014, 2010 and 2009. Interactive and advertising agencies that win a 2016 WebAward will automatically be included in the Award Winning Agency Database with a free premium listing. 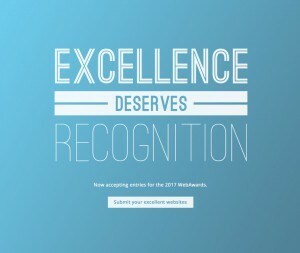 Each year, many agencies and some corporations win multiple awards and deserve additional recognition. This year, we will recognize each organization that wins 6 or more WebAwards with an Outstanding Interactive Developer trophy. In 2015, there were 16 agencies recognized with this prestigious award. Judging for the 2016 WebAwards will take place in June through August and winners will be announced in September. Judges will consist of a select group of Internet professionals who have direct experience designing and managing Web sites,–including members of the media, interactive creative directors, site designers, content providers and webmasters – with an in-depth understanding of the current state-of-the-art in Web site development and technology. Past judges have included top executives from leading organizations such as Universal McCann, SapientNitro, T Rowe Price, Bridge Worldwide, Disney, Euro RSCG, Boeing, Huge, ING Direct, VML, Facebook, J. Walter Thompson, Gartner, Possible Worldwide, YUM!, Cuker Interactive, PayPal, Razorfish, Munich Re, Refinery, Ernst & Young, Magellan Health Service, R/GA, Family Cookbook Project, Saatchi & Saatchi, SAP, Starwood Hotel, and Website Magazine. The 2016 WebAwards are sponsored by the following leading organizations: EContent Magazine, VerticalResponse, PR.com, ad:tech conferences, Webmaster Radio, and Website Magazine. The Web Marketing Association thanks these companies for their commitment to the entire online marketing community. Finding an “award winning” interactive agency has just gotten easier. The Web Marketing Association has just launched a new website that has brought together top advertising agencies and top interactive agencies who have won recognition in major award programs. This new searchable database of award winning interactive agencies is found at www.AwardWinningInteractiveAgencies.com. Location – Search by country and/or state to find agencies close to you. Languages – Need a specific language skills. Narrow your search to 10 different languages including English, Spanish, Turkish, German and Chinese. Additional languages will be added at a later date. Specialty – Finding the right agency also means finding someone who is an expert in your specific need. 53 specialties can be selected in areas include web development, online marketing, mobile, social media and public relations. The site also offers an InteractiveAgency Map that allows the user to click on the geographic area they are interested in and drill down to see the exact locations of various award winning agencies. Participation in the Award Winning Agency Database is free to all full service advertising agencies and interactive agencies who have won recognition in a recognized interactive award program. If your agency is not already listed and you’ve won awards, please add your agency to the AWAdb. The Web Marketing Association is working to create a high standard of excellence for Web site development and marketing on the Internet. Staffed by volunteers, it is made up of Internet marketing, advertising, PR and design professionals who share an interest in improving the quality of Website development and marketing on the Internet. Since 1997, the Web Marketing Association’s annual WebAward, InternetAdvertising Competition and MobileWebAwardaward programs have been helping interactive professionals promote themselves, their companies, and their best work to the outside world. Now in its 17th year, the WebAward Competition has become the premier award event for Web developers and marketers worldwide.